Outpost 2 originally came with a HELP file (.HLP). Over time, Microsoft deprecated using this type of help file, partly for security reasons. The help file was removed from the official Outpost 2 download to reduce the program's download size. Microsoft now encourages using HTML files instead. Getting the original help file to work on Windows 7 and above will likely require following the instructions below. If you are looking for current help and tutorials on how to play Outpost 2, see the Outpost 2 Online Manual Page. The Outpost 2 help file is contained within the zip file download above. The help file may also be found on the SVN repository at: https://svn.outpostuniverse.org:8443/!/#outpost2/view/head/GameDownload/Outpost2/tags/Outpost2-1.2.0.5-Sierra-CD-Install/Outpost2.hlp. In order for the help file to be accessed from the in game prompt, it must be placed in the root directory of Outpost 2 without changing the Help file's filename. After installing the Windows Help Program, you may receive an error message when attempting to open a help file. If your computer recognizes the help file came from the internet or other untrustworthy sources, you must unblock the file. Cannot display this help file. Try opening the help file again, and if you still get this message, copy the help file to a different drive, and try again. To unblock the file, right click on the file and select Properties. 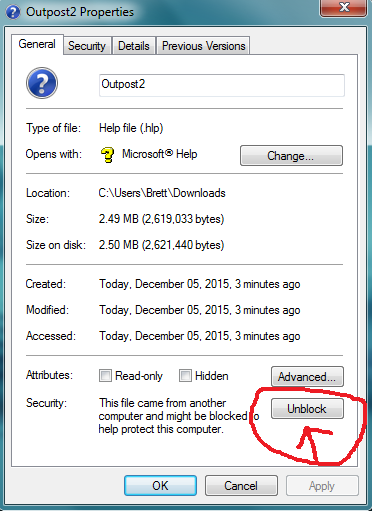 Then click Unblock on the bottom right of the dialog box. If the file still will not open, review the troubleshooting steps in the original Help Program download link.